Apologies to Sir Walter Scott — Jeremy Spath created that beauty for our library and our community and we are eternally grateful. Dedicated in 2011, our Garden of Friends is a demonstration garden of drought tolerant plants with identifying signs for home landscapers. It replaced the pines that stood for many years. Born in New York, Jeremy wanted to be an actor when he was young. He moved to this area when he was two and remembers his mom, who is very much a plant person, taking him to the then Quail Gardens. He was totally uninterested, thought it green and boring, didn’t like the smell, plus there were no animals. When he was around 30, he lived in a studio in Solana Beach with a tiny unexciting plot of dirt. He came home one day to find his roommate had filled it with plants, and as they grew so did his interest. When his mother, who is a docent at San Diego Botanical Gardens, told him of a job opening, he decided to apply. 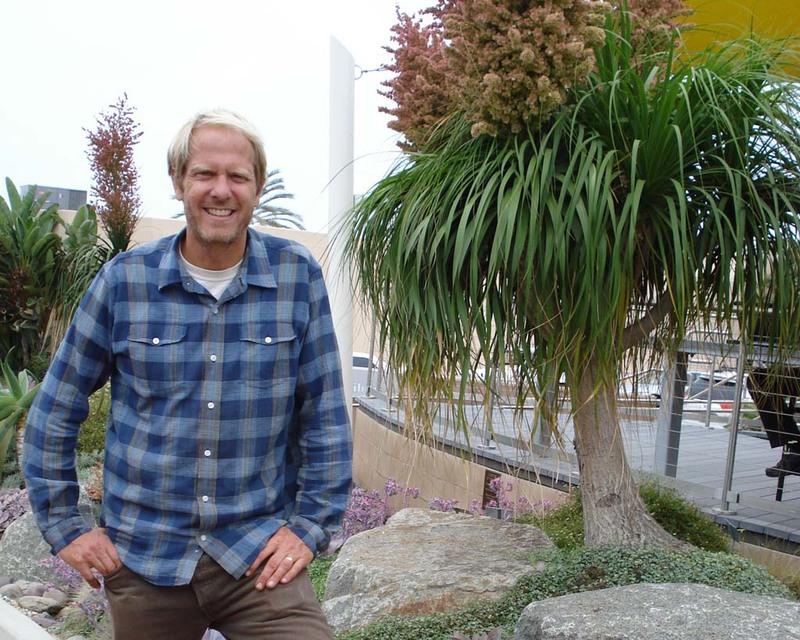 The late Bill Teague thought he would be good at gardening so under Bill’s expert guidance for five years he helped plan and design areas of the garden. Under the recommendation of Frances White, Bill drew up some plans for our garden but his untimely death kept him from finishing the project. Jeremy stepped in and without benefit of those plans, and created what we are now enjoying. He thinks plans are too static and prefers to work with a sketch and a basic plant list showing clients there will be a plant here, a tree there and then letting it happen always advising of drastic changes. He realized after talking to people who toured the garden that he could create a business, which is advertised by word of mouth. He also works at Rancho Soledad Nursery part time. Jeremy’s family is wife Grace and daughter Scarlet with another Spath on the way. His parents live in Cardiff-by-the-Sea and he has a brother and a sister. Surfing is a daily passion but his real love is travel and seeing plants growing in the wild explaining, to view plants growing in their natural surroundings is unbelievable and the same artistry can never be created in a garden. Just as we went to press Jeremy is working on a garden in Cardiff-by-the-Sea inspired by viewing ours. For more about Jeremy contact him at deepoceancurrents@gmail.com, or call (760) 277- 5969. Jeremy, his beautiful family and the lovely garden he created for our library all contribute to the many other wonderful beauties that make Cardiff-by-the-Sea the jewel we love to call home. A founding and life member as well as past president and current board member of the of the Friends of the Cardiff-by-the-Sea Library, Irene has lived here since 1982.